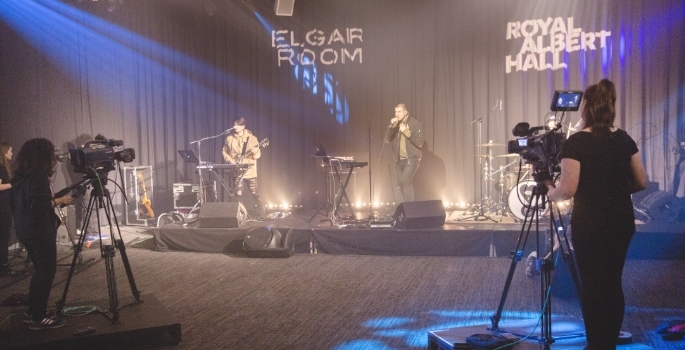 The workshop for sixth-formers and further education students gave insights into roles from directing and vision mixing to camera and live sound engineering, at a recording with BBC Introducing, showcasing an up-and-coming bands. Students from the Music and Live Events, Audio and Music Production, and Film and Television Production courses at Bucks New University carried out the work, filming the band Kovic. Stephen Partridge, Head of Media and Creative Industries at Bucks New University, said its Music and Live Events Management staff regularly supported the Royal Albert Hall’s own workshops in events management for young people at the world-famous venue. Bucks New University has worked with BBC Introducing for over two years, with up-and-coming bands and artists regularly recording performances at its High Wycombe Campus which have been shown online and broadcast on BBC Three Counties Radio. Photo: Andy Paradise / Royal Albert Hall.